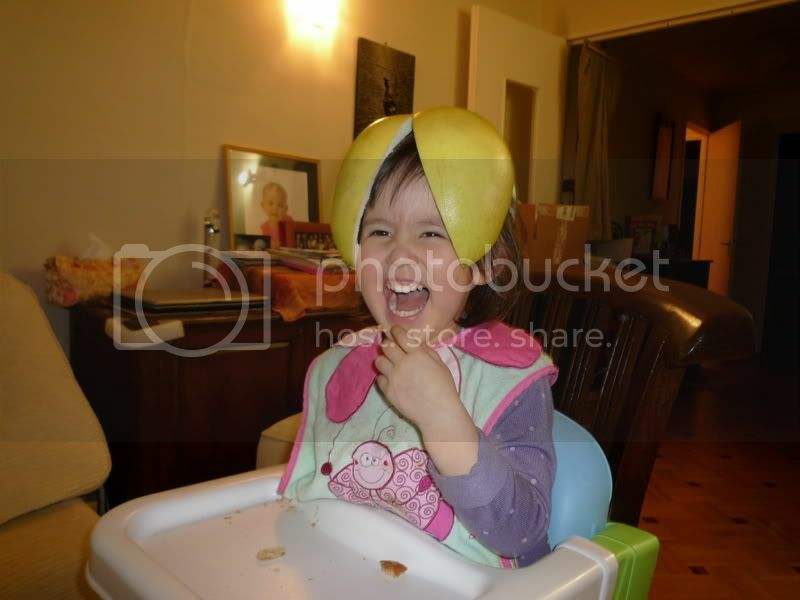 Across 2 Cultures - Cross-Culture Parenting and Lifestyle Blog: Silly pomelo head! I bought some pomelo from the supermarket and this is what happened during dinner time after I peeled the skin off. HA! :p It's one thing for a little child to have a pomelo head and another for the parents to spot the same trick so nope, no such luck at seeing the parents being silly. :p You'll have to come by to our home to personally experience our "corniness". Gosh they are all the same. N just did the same thing when I asked her to throw away the pomelo skin. She promptly put it on her head too !! BTW X has never tried pomelo until I bought one home a few months ago & now it's the favorite in our family.